A very large, English copper sugar bowl on a steel stand. The bowl dates from c.1920 but the stand has been made, quite recently, to accomodate the bowl. 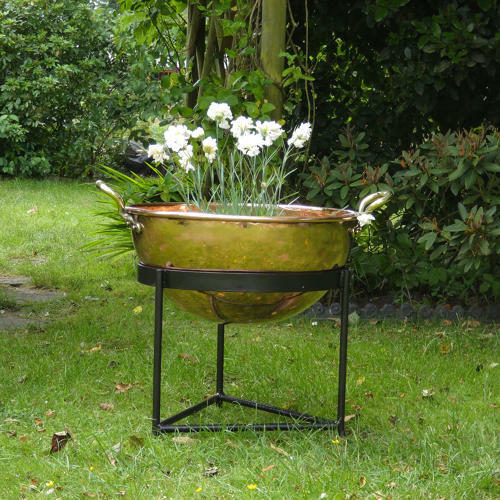 The bowl is made from a very heavy gauge of copper and it has a plannished finish. It is 53cm. (20 7/8in) diameter by 26cm. (10 1/4in) deep. Originally it would have been used for caramellising sugar. It could still be used for this purpose as it is in excellent condition. However now, with the addition of the stand, it would also make an interesting decorative feature or large jardiniere. The stand is made from steel and has a black hammerite finsh. Price includes postage within the U.K. Shipping elsewhere on application.